For many years now In The Night Garden has been a firm favourite on CBeebies, and Iggle Piggle and co are an essential part of the bedtime routine for little ones. For over ten years now, preschoolers have been snuggling down to sleep and dreaming of the adventures of Iggle Piggle, Upsy Daisy and all the In The Night Garden characters. The new spring range of In The Night Garden gifts for pre-schoolers and babies has just been launched and includes toys, books, pyjamas, DVDs, baby gifts and magical live experiences. There’s even a themed In The Night Garden room you can stay in at the CBeebies Land Hotel at Alton Towers! These “talking softies” are part of the new In The Night Garden range and are soft, cuddly characters. Choose from Iggle Piggle, Upsy Daisy or Makka Pakka. Press their tummy to hear them make fun sounds, they’re super soft and perfect for snuggling. They’re available from Smyths Toys and Debenhams and they cost £9.99 each. This great product range inspires children’s imaginations and really helps to extend the In The Night Garden magic beyond the screen. Who is your favourite character? For more In The Night Garden magic, follow them on Facebook. To be in with a chance to win an In The Night Garden Iggle Piggle Talking Softie worth £9.99, simply complete the Rafflecopter widget below. Good luck! 5. 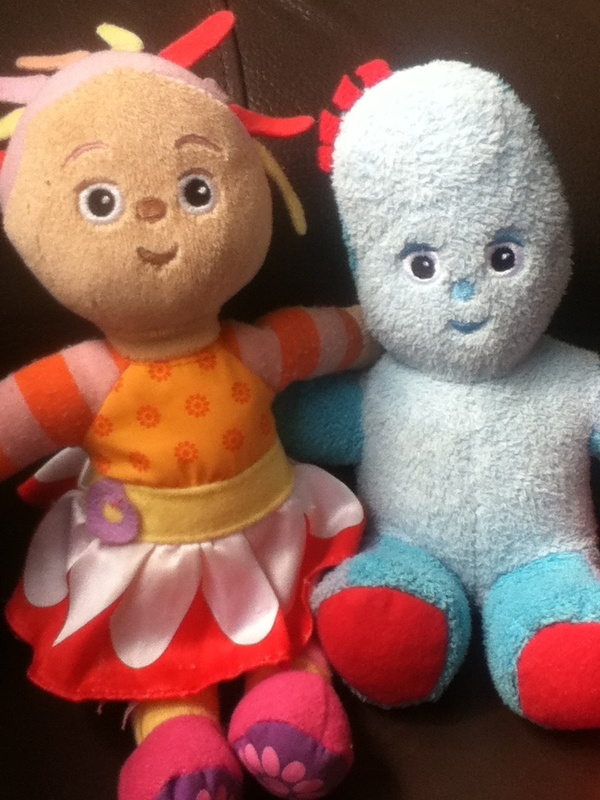 The winner will be sent an In The Night Garden Iggle Piggle Talking Softie. 6. The closing date for entries is 11.59pm GMT on 29th April 2018. When my Mr suggested we take the boy to see his favourite thing in the world my heart sank a little. It’s not that I want to deny him fun, but thanks to BBC iplayer I get “treated” to about four episodes a day and I cannot bear it. So many months ago I reluctantly agreed, took out a small mortgage and bought some tickets. We refused the horrifyingly expensive add-ones. £15 to meet Daisy. No thanks, if she was going to come back to ours and get cracking with the ironing maybe. But no. £20 for a goodie bag? No! He’s 2 he doesn’t really care. So we arrived early and we were ushered through the massive inflatable theatre in the car park of the Trafford Centre. The boy didn’t really understand what was going on but did get excited each time he saw a picture of a character. We found what were excellent seats and settled down. As I said, we arrived early and we waited half an hour for it to start. But no worries, they had fabulous projections on the walls which kept the little ones entertained as well as In The Night Garden (ITNG) sound effects. The half hour passed quickly, punctuated only by being mugged for £6 for a twirly light with Iggle Piggle on it, admittedly it kept him entertained for the rest of the evening and beyond. But tat all the same. The show started much to the boys delight, it was colourful, entertaining and true to the TV version. Both husband and I were horribly bored after about 20 minutes but we were both enchanted by the delight on our sons face. He loved it, every second, every song, everything about it. It lasted about 50 minutes and much to the boys disappointment we had to leave. In the car on the way home he was shouting “Again, Daisy, again!” Bless him. Would I go again? Yes. But I do feel like I’ve been spanked for cash, but pretty much anything you do with your kids feels like that these days. Disclaimer: I wasn’t paid or asked to write this post, I went of my own accord and paid for the tickets and everything else myself.